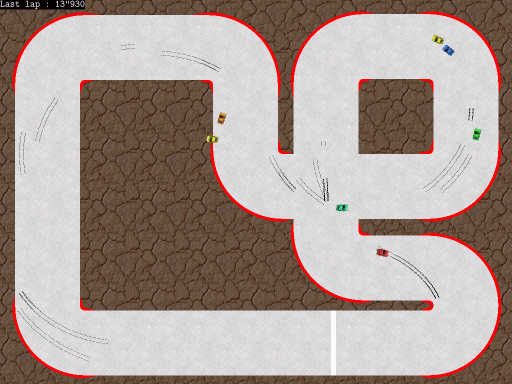 The purpose of this little car game is very simple : do the best time on each track. It is inspired by the online game "Renault F1", as well as other free games like GeneRally and Trophy (I use some sounds from this game too). Some tracks are those from the ICFP Programming Contest. zeRace is coded in C and uses the SDL library. A "circuit.png" image, which is what the track will really look like (what the player will see on the screen). The image format is PNG 1024x768 24 bits. The green layer is the track quality (the greener, the faster). The "road" should be "255". The "0" values are walls. The red layer are "checkpoints". The track is splited in 32 checkpoints (pixels with a red layer between 0 and 7 are first waypoint, pixels with red layer between 8 and 15 are second waypoint, etc). The blue layer is the grip (high values slide a lot). To do such a picture, you can use layers in "addition" mode. You must also edit the "list.txt" file in order to add infos for your track. Disable your internet connection since this file is overwritten each time the game is launched !